Pay half your life, rounded up: Anna's controller sacrifices her. Any player may activate this ability. : Return Anna from your graveyard to your hand. Gain 2 life. "The law is harsh, but it is the law." Check out my podcast, Magic on Tap, on Facebook and Twitter! Embrum the Impatient can't wait for this challenge to be judged by someone. Exile two cards from your hand: Put Ranodran, the Silent from your graveyard, exile or the command zone onto the battlefield. Activate this only as a sorcery. Ranodran, the Silent’s power and toughness are equal to the number of cards in exile. You can't actavte the ability when there is only one in your hand. Players can't play nonbasic lands. At the beginning of each upkeep, each player may put a land card from their hand onto the battlefield. Then each player sacrifices a nonbasic land. I'm sick and suffering so no lengthy commentary today I'm afraid, feel free to PM me if you actually want feedback. fluffydeathbringer wins. The spells used as basis are Harsh Sustenance & Ethereal Ambush. 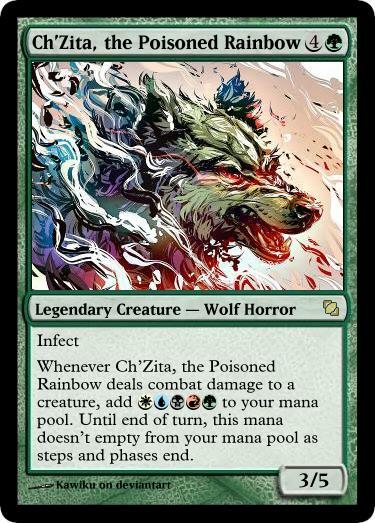 Whenever Ch’Zita, the Poisoned Rainbow deals combat damage to a creature, add . Until end of turn, this mana doesn’t empty as steps and phases end. When Tul Dasa enters the battlefield, Support X, where X is the amount of spent to cast it. Then Tul Dasa deals 1 damage to each creature that doesn't have a +1/+1 counter on it for each spent to cast it. Whenever you sacrifice one or more creatures, add . , Add to your mana pool. Sorry I vanished. Judging in 24. OK, now concerning your next challenge.. Currently, it's way to hot here in Germany. So I'd like you to design a Commander who's all about ice, snow, rain, clouds, storm or whatever similar you can think of. Whether you go for pure flavor or a mechanical representation as well is all up to you! This challenge happened to fit nicely into a mechanic I'm hoping to put into my set (negative abilities as keywords), so I figured I'd roll with it. Whenever Adesh, The Gathering Storm attacks, you gain . 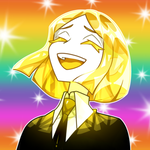 Adesh has +1/+0 for each you have. As long as you have or more, Adesh has first strike. 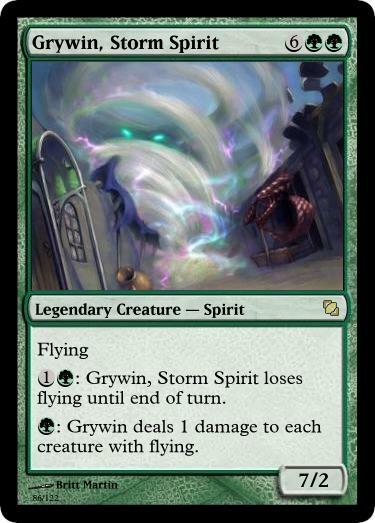 : Grywin, Storm Spirit loses flying until end of turn. : Grywin deals 1 damage to each creature with flying. An old elf wizard with the gift of inmortality who lives in a plane covered with ice. He is the last living being in it. mrlozano You can just say "Nonland permanents don't untap during their contrller's untap step." Unless they were supposed to not untap for any reason which a) isn't a thing on any card anywhere as far as I can tell, and b) means that his final ability does nothing as no untaps ever happen. When ~ enters the battlefield, create two 0/1 white Citizen creature tokens. Appeasing a god carries a terrible price. digiman619 True, fixed. Thank you! When Kolah enters the battlefield, the next instant or sorcery you cast gains storm. : Return Kolah to its owner's hand. This challlenge will be judged once I've finished with the Poor Man's Edition - so get your final entries and edits in! EDIT: This challenge is now closed, please no further changes of entries! Whenever Ashley, the Winter Storm attacks, tap up to two target creatures defending player controls. Those creatures don't untap during their controllers next untap step. 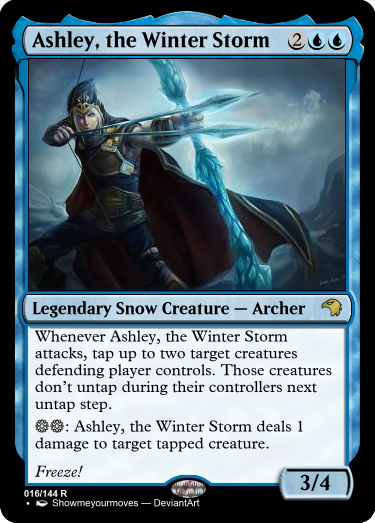 : Ashley, the Winter Storm deals 1 damage to target tapped creature. Is that last ability breaking the color pie if it requires snow mana to activate? Tough question, to be honest Still, even if it is, I really like the design concept behind your entry. : Target creature you control gets „If this blocks a creature, freeze it.“ until end of turn. Mono-green flyers are always a bit iffy (outside of cycles), but I have to admit the flavor really works here. That aside, the otherwise weird 7/2 stats really work nicely here. 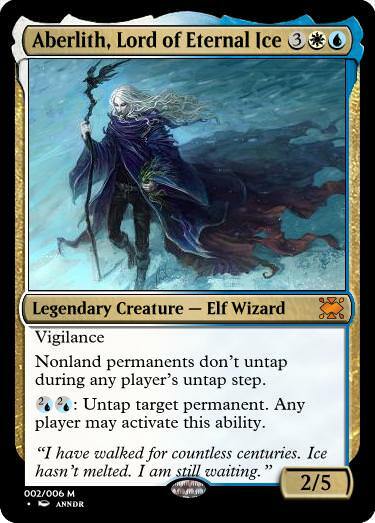 Personally, I think it feels a bit lackluster as potential Commander, though – it looks more like a „normal“ rare to me..
Nonland permanents don't untap during any player's untap step. : Untap target permanent. Any player may activate this ability. I'm a bit torn on this card. That second ability feels like it would just be annoying to play against, even though the political options of being able to untap your opponents' stuff sounds pretty cool. Also I really like how you used the two-brid mana cost. A powerful ability, but requiring tapping your creature to activate it should balance it out – sacrificing a creature really isn't much of an issue within these color even if it didn't bring its own sacrifice fodder (even though: it does ). It actually might be a bit to slow / less explosive for the formats where you'd want to have fun with it, but that might just be me.. When I gave that challenge, I definitely did not expect a mono-red entry – well done That aside: Holy crap, this looks scary – even though CMC7 really keeps this in check pretty well. Actually, it feels like this card is mostly useless unless you can really abuse it where it almost instantly becomes broken. 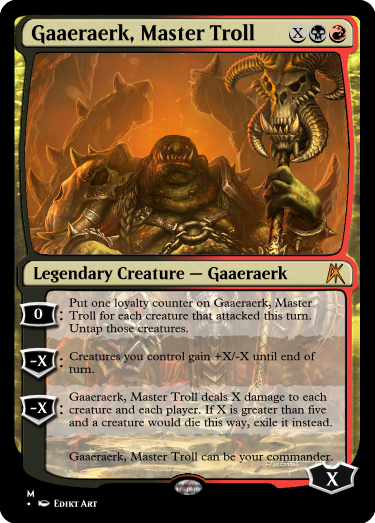 Which means: It would definitely get some love as potential commander (even if I'm not its target audiance). This really was an interestig and very diverse bunch of cards – well done, everyone! 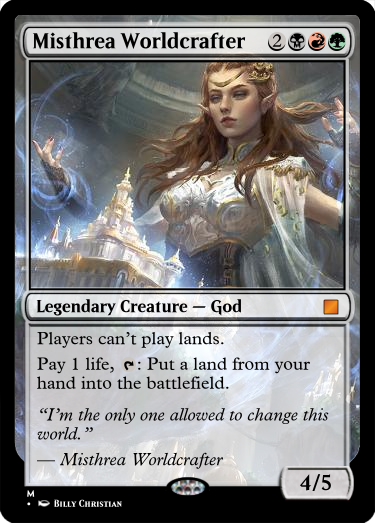 In the end I decided to give the win to mrlozano for designing a commander offering so much potential for political gameplay and using two-brid mana the right way. Great Job guys! I showed up late and will have to wait for next round but this was fun to watch! So, thx for the win! I will be quick. 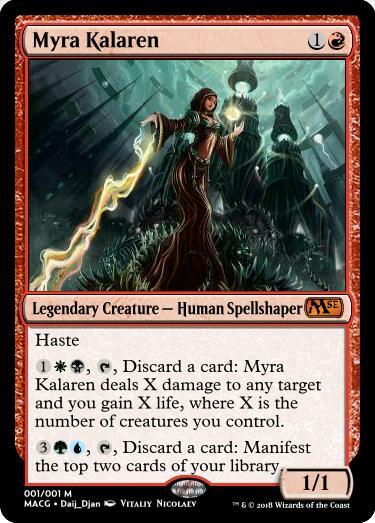 Commander 2018 is out and looks pretty sweet to me. 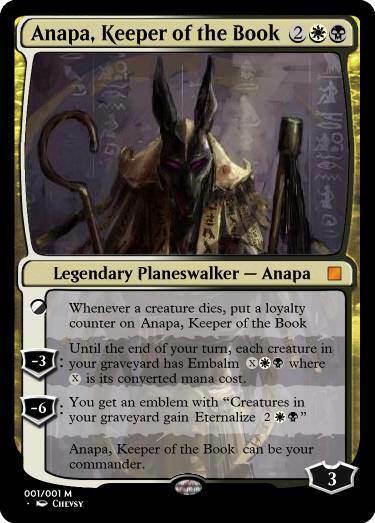 Each planeswalker cares about a permanet type, but creatures got no love this time (I understand why). 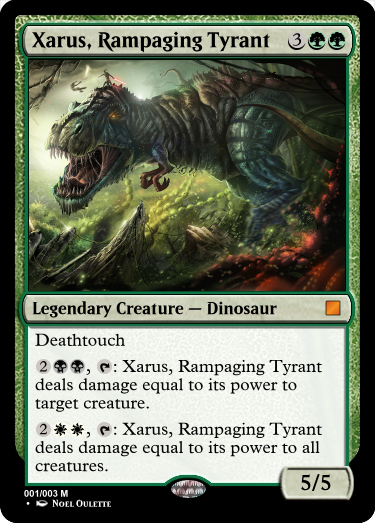 So, the task: Make a Planeswalker that can be a commander of a t least two colors, that cares about creatures but doesn't include green. I know that there are lots of restrictions but I want to see what can you come up with. Best of luck! I think you will need to judge around the 24th to give everyone a week to get their work in and perhaps edit a few drafts. Don't take me as an authority. I just got here. Just seems to be the general vibe. Special thanks to Flo00 for some quick but valuable corrections in game-text.